Sun Myung Moon (문선명, 文鮮明), (February 25, 1920 (lunar: January 6, 1920) – September 3, 2012), was born in North Pyeongan Province, which is now part of North Korea. He founded the Unification Church (known formally as The Holy Spirit Association for the Unification of World Christianity, founded May 1, 1954, Seoul, Korea; with missions and centers in 185 countries) in 1954, the Family Federation for World Peace and Unification, August 1, 1996, and the Universal Peace Federation in 2005, in New York City. He is also well-known for holding, since 1960, Blessing Ceremonies, which are often called "mass weddings," and for founding The Washington Times newspaper in 1982. Reverend Moon was a prolific speaker, his writings filling over 400 volumes, and his original religious teachings are published as the Exposition of the Divine Principle (1996). More than just a religious leader, Moon founded and supported dozens of organizations to advance international understanding and build lasting peace in the world. 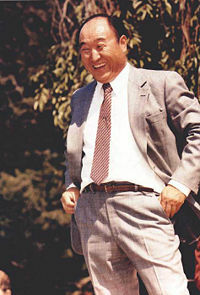 A long-time opponent of totalitarian communism, Moon developed a systematic ideological critique and counterproposal to communism, which he propagated through the world in the 1970s and 1980s and which strengthened the resolve of anti-communist elements in numerous front-line states. Since the demise of the Soviet Union, he was an ardent supporter of reconstruction in post-communist societies and invested heavily in the development of North Korea. Other examples of his diverse humanitarian efforts include founding The Little Angels children's dance troupe as Korean cultural ambassadors, developing fish-based protein supplement to fight hunger and malnutrition, organizing numerous interfaith conferences to foster cooperation among religions, proposing the establishment an inter-religious council at the United Nations, and advocating a tunnel across the Bering Strait to unite the world's nations by an international highway. Most Unification believers understand Reverend Moon to be fulfilling the mission of the promised "Second Coming of Christ." 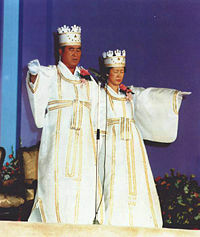 Also, together with his wife Mrs. Hak Ja Han (Moon) (한학자, 韓鶴子), believers understand them as the "True Parents" of all humankind. The latter ascription derives from the view that Reverend and Mrs. Moon are the first human beings to realize the "original ideal of creation," a responsibility originally given the first human ancestors, the biblical Adam and Eve. In the English speaking world, Sun Myung Moon is often referred to as "Reverend Moon," both by Unification Church members, and by the general public and the media. Unification Church members most often call him "Father" or "True Father." Some mainstream Christian clergy who have come to associate themselves with the Unification Movement took to calling him "Father Moon." Similar titles are used for his wife, Hak Ja Han (Moon), who is referred to as Mrs. Moon, and often called "Mother," or "True Mother," and again clergy working with the Moons have taken to calling her "Mother Moon." Reckoning by the lunar calendar, by which many Korean people record their birthdays, Sun Myung Moon was born on January 6, 1920 (February 25, 1920 C.E. ), in Sangsa-ri (상사리, 上思里), Deogun-myun (덕언면, 德彦面), Jeongju-gun (정주군, 定州郡), North P'yong'an Province (평안북도, 平安北道), Korea (now in North Korea), the fifth of eight children who lived past childhood in the family of Moon, Kyeungyoo (문경규, 文慶裕) and Kim Kyung-gye (김경계, 金慶継), who gave him the name Yongmyung (문용명, 文龍明). People from North P'yong'an Province are known for their strong and stubborn natures. Many important figures in the Korean Independence movement came from this area. As a young boy, Yongmyung was known for his strong sense of justice and for his reputation for tackling difficult tasks and sticking with them. In 1920, Korea was already under the control of Japan. Reverend Moon was born to a rural family. If he had lived even a few decades earlier, he very likely would not have had the opportunity to obtain a formal education, since education during the Joseon period (1392-1897) was available almost solely to sons of the Yangban, or noble class. 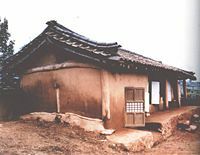 It was the influence of Protestant, Christian missionaries, with missions in Korea starting from the late 1880s, that allowed for the expansion of educational opportunities to include all classes and including both both and girls. Attending the local sodang, or Confucian primary school, Moon's early years of study included learning to read and write the Chinese characters that were used for all scholarly works in that time. He was taught to master key works of Confucian and other classic literature. It was held that these texts contained the wisdom through which citizens in Confucian society learned how to live, especially how to relate to others. One of the most important elements in Confucian teaching is the view that no life exists in isolation from others, and that it is crucial to keep the proper relationships with the key persons in one's life, such as one's King, parents, siblings, children, spouse, and friends. Confucian ethics had prevailed throughout the entire Joseon period, largely to the exclusion of Buddhism, Christianity, and other religions. Under some Joseon monarchs (especially in the early years), Buddhists and Catholic and Protestant Christians were severely persecuted and even killed. Only after the 1880s did it become been safe to practice Christianity in Joseon Korea. 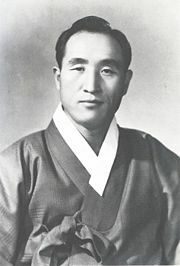 Many members of Sun Myung Moon's family became members of the local Presbyterian church, the same church that Sun Myung and his brother also began to attend (he was 11 years old at the time). 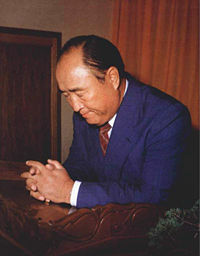 Like many Christians in Korea at that time, Sun Myung Moon would have spiritual encounters with Jesus during prayer. He had a particularly dramatic encounter on Easter Sunday in 1935, that determined the direction of the rest of his life. In prayer on a hill near his home, he relates that Jesus Christ appeared to him and asked him to devote his life to the service of God and to take on the continuation of Jesus' mission of bringing salvation to the world. Reverend Moon reports having tried three times to reject this mission (realizing the hardship it would entail), but surrendered to Jesus' insistence on Jesus' third try. 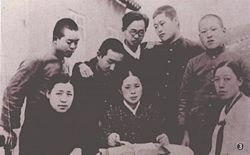 Sun Myung Moon (third from left) with a missionary and group of church members at Myung Su Dae Church during his student days in Seoul, ca. 1940. While a student in Seoul, Moon attended services at several churches, including one of the first Pentecostal churches in Korea. Later, he attended the Heuksong-dong congregation of the Jesus Church, a new church founded and organized by a local evangelist, Yong-do Lee. Evangelist Lee's ministry was filled with spirit, and sometimes his sermons would continue for four, six or even eight hours. Moon also served as a Sunday School teacher at the Myung Su Dae Church. Throughout his worship, prayer and studies, Sun Myung Moon's inner thoughts were constantly focused on how to accomplish what he had promised Jesus. He sought knowledge through nature, through his incessant study of the Bible, and through his prayerful "travels and encounters in the spiritual world." He studied the lives and teachings of saints and religious leaders, and read the Bible from cover to cover several times. Following his graduation from the Kyeongsong Institute, Moon obtained permission to pursue further studies in Japan, and entered the technical high school under the auspices of Waseda University in Tokyo, making the trip to Japan in 1941. With the shadow of World War II looming, the relationship between the Japanese occupation government in Korea and the Korean Christian Churches, which had always been tense, became even more strained. The Japanese government was wary of the Christian churches, because many of the most fervent activists in the Korean independence movement, which had been working to secure Korea's independence from Japan since their first demonstrations for freedom in 1919, were Christians. With the war getting closer, Japan ordered all Koreans, including the Christians, to worship at the Japanese Shinto shrines. The following year, in 1942, the foreign missionaries were ordered to return home, and all the Korean churches were directed to abandon their denominational affiliations and join the Japanese Christian Church. Ministers who were not willing to worship at the Shinto shrines or change denominations were imprisoned and sometimes killed. Koreans were also required to take Japanese names and speak Japanese instead of Korean. Moon took the Japanese name Emoto Ryumei while studying in Tokyo. While there, he met other Korean students who supported the independence movement and the exiled Korean government in Shanghai. Whenever they gathered, Japanese plainclothes police officers would join the meetings to listen to what the rebel students were saying. Among Moon's friends in Tokyo were Christians and Communists. He could see that they were all trying to make the world a better place, although they had deep disagreements about how to go about it. He continued to study the Bible, in Japanese and English, as well as Korean. He disciplined himself in his studies and also trained himself to be able to endure many kinds of physical challenges, trying to work faster or harder than others, to survive on less food, to do the most difficult jobs. Many of his fellow countrymen hated the Japanese because their occupation of Korea was so stifling, but Moon felt that the enemy he had to fight against was not Japan, but the forces of evil, a much broader and more time consuming battle. He tried to love and serve the Japanese people, and prepare himself for the mission he had received, to battle against evil on behalf of all people. Reverend Moon had to shorten his course of study at the technical high school by six months because the war began to affect daily life in Japan. His class graduated in September 1943. As he prepared to return to Korea by boat, he felt a premonition of danger regarding the Kwon-non Maru, the boat he was scheduled to take, and changed his ticket at the last minute. As it happened, the Kwon-non Maru hit a mine and sank, drowning hundreds of passengers. His family knew he had planned to be on this boat, and naturally presumed he had been killed. They were astonished to see him walk up to his home a few days later. Soon after returning to Korea, he married Sunkil Choi, in a traditional matchmaking arranged by the couple's parents. He and his bride moved to Seoul, to Heukseok-dong, where he had lived earlier as a student. Moon worked at a construction company as an electrical engineer. 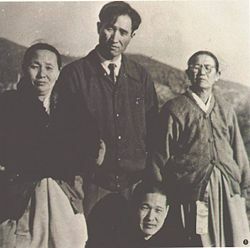 Sun Myung Moon reunited with some of his earliest followers from Pyungyang, in Seoul in 1955. A year later, he was arrested on suspicion of being a communist as a result of having made communist friends in Japan. He was severely tortured, to make him confess to being a communist, but he repeatedly stated that he was a Christian, and not a communist. After holding him in jail for a few weeks, the police finally concluded he was not a communist and he was released. When Japan surrendered to the Allies on August 15, 1945 (celebrated today as Liberation Day in Korea), Korea was free of Japanese rule for the first time in nearly 40 years. Koreans were elated. Sun Myung Moon marks this day as the beginning of his public ministry. In the ten years since his encounter with Jesus, he had not spoken with anyone about the mission to which he had been called. But now, freed from the strict scrutiny of the Japanese occupation forces, he was free to teach what he believed. Nevertheless, he continued to attend church services, to study the Bible, and to persist in his search for answers about God, the world, and the purpose of human life. In 1946, Reverend Moon left to take a short trip to Pyongyang, North Korea, the city where Korean Christianity was the most active. As the trip was meant to be short, he left his wife and infant son, who had been born earlier that year, at home. In Pyongyang, Reverend Moon began teaching, holding prayer services, and giving lectures. Often the sessions went late into the night. Eventually, he was arrested by North Korean authorities for disturbing the peace, and held in jail for several weeks and tortured. Though suspected of being a spy for the American military government in South Korea, he was finally declared innocent by a Soviet official and released. While in jail, he met some other Christians who felt they had been led to him as a special teacher or prophet. After his release, the people who had become disciples nursed him back to health, whereupon he continued preaching, teaching, and praying. His teaching led him to be disliked by both the established Christian churches, because he was luring members away from them with his charismatic message, and by the anti-Christian communist authorities, because his congregation was too visible, and did not fit the mold of the established church, whom the authorities ignored if they kept to themselves and did not disturb society. In 1948, he was arrested again and charged with being a swindler, depriving people of their money with promises of spiritual rewards. This time he was found guilty, and sentenced to five years in a communist labor camp. A five-year sentence to the Heungnam labor camp was, for all intents and purposes, a death sentence. Prisoners were worked to death. Labor was overwhelming and debilitating, rations were scant, and conditions horrid. Moon credits his own survival to God's protection over his life, his orientation for the welfare of others as greater than for himself, and his habit of saving half his meager water ration for washing the toxic chemicals off his skin after long days of work bagging and loading chemical fertilizer with his bare hands. While he was in the labor camp, the Korean War began. He had served 34 months of his sentence when he was liberated in 1950, after UN troops advanced on the camp and the guards fled, releasing all the prisoners who remained alive. The day of his release was the day he was to be publicly executed. His devotion to the United States (who led the UN forces), the United Nations, and the 16 nations (and Korean War veterans) whose soldiers fought for Korean liberation, has been unending, lifelong, and central pillar of Reverend Moon's gratitude and activities for his entire life. After his release, rather than race to the South along with the streams of refugees, he spent 40 days searching for and gathering each one who had responded to him as a disciple. With them he traveled to Pusan, arriving January 28, 1951. Pusan in the early 1950s was crowded with refugees who had fled from North Korea during the Korean War. Moon worked at a United States army base to support himself while he taught, preached, and collected disciples. One of his early disciples in Pusan, Hyowon Eu, was a good teacher and writer who collaborated with Moon to produce the first written version of his teachings, usually called the Divine Principle. This first version, titled Wolli Wonbon (never published, but there remains four extant handwritten manuscripts) was completed in May 1952. In March of 1954, Moon and his followers moved to Seoul. In 1953, Moon decided that his birth name, Moon Yong Myung was not a suitable name for a Christian evangelist because Yong, which means dragon, might be interpreted by some people as referring to serpent, devil, or the antichrist. So, he decided to change his name to Moon Sun Myung. The Chinese character for Moon(문, 文) means word or literature, while the character Sun (선, 鮮), composed of fish and lamb (symbols of Christianity), means fresh. The character Myung (명, 明), composed of sun and moon, means bright. Together, Sun-Myung means make clear. So the full name can be taken to mean the word made clear. Rev. 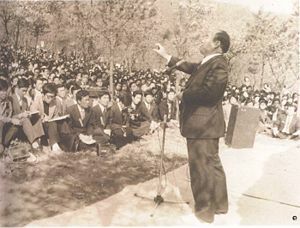 Moon speaking to a gathering of followers in Korea ca. 1965. On May 1, 1954, Sun Myung Moon founded the Holy Spirit Association for the Unification of World Christianity (HSA-UWC), most often referred to as the Unification Church. His congregation was astonished when they heard the name that their teacher had chosen for the young church, because of its grandeur. They could not imagine how their tiny, young group could impact even Korea, let alone Asia or the world. The new church encountered difficulties right away. Established Christian churches and Christian schools objected whenever members decided to join Moon's church. As a way to oppose Moon, some reported to the authorities that he had evaded the draft. Moon was arrested once again, this time he was held for three months in the Seodaemun prison before being cleared of the charges and released. All the while, the number of members steadily grew. In July, 1957, Reverend Moon sent pioneer Unification missionaries out to 116 cities and towns throughout Korea, and training programs for overseas missionaries were begun. In 1958, missionaries were sent to Japan, and in 1959, to the United States, and then Europe. Mission work was further expanded in 1975, when teams of missionaries including members from Japan, the United States, and Europe were sent to 120 new mission countries. In the early 1970s Rev. Moon and his family moved to the United States, where Rev. Moon toured the United States by road, speaking at evangelistic gatherings around the country. In this way he both shared and trained his followers on the path of missionary life. Much of his evangelistic mission upon his arrival to the U.S. was to elevate American democratic ideals. He launched in the U.S. what he called the One World Crusade (OWC) in the 1970s, with a message he felt called America to its godly foundation and Christians to live "God’s way of life" and anticipate the second coming of Christ. These tours, entitled "New Hope for Christianity," the "Sun Myung Moon Christian Crusade," and finally the "God Bless America Festivals" (1972-1976) conveyed a pro-God, pro-family, pro-America, and anti-communist message. 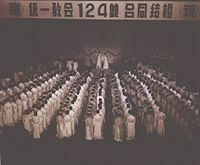 Through the 1970s Unification Church in America experienced a dramatic growth spurt, from a few hundred to over 3,000, in addition to the hundreds of missionaries arriving in the U.S. from Japan and Europe. Parents and public reaction varied from polite positivity to outrage and opposition, and even violent and illegal assaults on adult children who had decided to join up with the revival work of Reverend Moon. Reverend Moon never responded to opposition with public counter-attacks or even explicit self-defense, but rather took proper and necessary steps to preserve the right of his own church to exist in America, to fund-raise and to be protected from deprogramming—the abduction and confinement of believers in order to break their faith. Attacks intensified in the 1980s, culminating in Reverend Moon's arrest and trial by the U.S. government on charges of tax evasion. Many believe these charges were wholly without merit, and designed for the sole purpose of driving Moon from American soil. At this point, many American Christian leaders saw this prosecution as a threat to the freedom of the clergy in general, and thousands of clergy rallied in support. After he was convicted, the government offered him the option of leaving America as a way to avoid prison time, but Rev. Moon refused, declaring that he would rather endure prison than abandon God's work in America. Despite being sentenced, in 1982, to 18 months in prison, of which he served 13 months at the Danbury Correctional facility before being released on good behavior to a halfway house, Reverend Moon sought to love and serve his oppressor by establishing the Washington Times newspaper (1982) and the American Constitution Committee (ACC) (1987)—later to become the American Freedom Coalition and, after the fall of communism, the American Family Coalition (AFC). These and many other organizations, including the Women’s Federation for World Peace (formed 1992), were convened with the the mission to elevate the idealism and dispensational purpose for the democratic world, especially the United States. To maintain responsible stewardship of the earth and all of nature, and live a joyful and abundant physical life in preparation for an even more fantastic joy and abundance in eternal spiritual life. Rev. 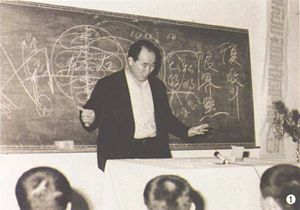 Moon always uses a blackboard when he preaches, using many diagrams and charts to illustrate the relationships between the elements in his teachings. In addition to teaching about the Three Blessings, the Principle of Creation teaches that everything in the universe has paired attributes. The first set of equally valued and complementary pairs of attributes can be expresses as male and female in the case of people and animals, positive and negative in the case of electricity and elemental particles, yin and yang as expressed in oriental philosophies, and so on. Reciprocal give and take between these pairs is essential to life, survival, and growth. A second set of characteristics that everything in creation has is an internal character and an external form or manifestation. In people, this is often expressed as the spirit and the body. In animals, it may be called instinct and body. Even the smallest elements in the universe, protons and electrons, possess an inner "directive," or purpose, that defines and guides it. Nothing in creation acts randomly. When God created them, he endowed them with an inner "identity" that manifests itself in a form that corresponds to its unique purpose. The Divine Principle also concludes that God, as the Parent, Origin, and Creator of everything, likewise reflects the same structure, attributes, and dynamics. (God creates in a way consistent with God's self). Thus, God should properly be understood as the perfect union of male and female (Heavenly Father and Heavenly Mother), that is the wellspring of perfect love, namely parental love for all persons, and for everything. Likewise, God has an internal and external reality. God is eternal and omnipresent; thus God's external self is not physically visible. It is comprised of, or is, energy. God's internal self, like that of humanity, is mind, conscience, and the impulse to love and exist for the sake of the other. With this understanding, people are special in creation. They are God's children, created to exist in a loving relationship with God; receiving love from God, and returning love to God. Human beings resemble God more completely than anything else. The Divine Principle goes so far as to say that God can dwell fully and perfectly in an ideal human being, and in fact only in this incarnate. This being the case, God endowed human beings with creativity—the ability to make something new. This, too, is unique to human beings. The freedom with which God endowed human beings is genuine. It can be used in whatever way they choose. This is the only way a love relationship is possible. One must be able to choose freely, and make her own decisions. Full qualification to be children of God who can grow up to have value equal to God requires that humanity possess free will and make its own choices as to whether it will pursue good or evil actions. This also entails that God self-limits his power to control humanity. Of course, God hopes that everyone will choose good actions and create a world full of goodness. But God cannot force this decision, or make people robot-like. These decisions rest with each person. Throughout history, men and women have used their God-given freedom more for ill than for good. Jealousy, hatred and the evils of licentiousness, infidelity, and violence defile the human record. This abusive and self-destructive bent is referred to in the Divine Principle as fallen nature, a departure from the original (God-given) nature with which humans were originally created. It arose as a consequence of the biblical Fall of Man, when the first human ancestors Adam and Eve transgressed God's commandment. But unlike traditional Christian doctrine, Divine Principle does not regard disobedience per se as the cause of Original Sin. It was rather what specific act Adam and Eve did in their disobedience that trapped their descendants (all humanity) in a disordered and corrupt relationship with Satan and put a lasting stain on the human soul. Reverend Moon understands that original transgression as fornication, and the meaning of the commandment "do not eat" as a prohibition of sexual relations outside the sphere of God's permission. Eve was seduced by the archangel Lucifer, or Satan, and by their illicit love the angel claimed rights over her and transmitted to her his nature of rebellion, jealousy, and fear. Eve then seduced Adam, thus making Satan the author of their love, rather than God. As a consequence, Satan could claim their children as belonging to his lineage. God was plunged into grief, as he saw humanity, who were purposed to be His children, defiled and taken from him. In order make the original ideal for creation possible, everyone must learn the steps necessary to dissolve the wellspring and origin point of humanity's evil propensity, allowing behavior to flow from the original nature, giving rise to truth, beauty, and goodness. When this happens, God will be freed from the grief he has endured throughout human history, seeing the suffering of his children, and all people will be freed from what is falsely felt to be the irresistible strength of sin and evil. The Divine Principle describes the restoration and liberation of the original nature has having two parts. One part is following the way of life that leads to the dissolution of fallen nature, by faith in God and practicing love for one's enemy. This is to fulfill a responsibility to reverse the process of the human fall and separate from Satan's influence. The other part requires the removal of original sin by undergoing rebirth through the Messiah. God seeks to move history in the direction of greater goodness (indeed to the complete triumph of loving goodness). Divinely inspired and God-filled teachers such as Jesus, Muhammad, Buddha, Confucius, and many others appear periodically according to God's providential time table. Each has a specific mission to lead a portion of humanity in the right direction. The religions they founded guide human beings on the way of restoration, as the commandments to obey God and love one's neighbor are universal to all religions. Nevertheless, God and all people await the day when each person can fully resist evil at will under their own power. This requires the advent of the Messiah. Sun Myung Moon feels that the mission he received from Jesus in 1935, when he was 15 years old, is to fulfill that messianic calling—to sever each person from the root of "Satan's blood lineage" and graft each onto "God's blood lineage," and to teach the path through which humanity can dissolve permanently the root of fallen nature. Reverend Moon's teaching gives highest regard for the family, which he calls the natural "school of love." God's love is expressed in the give and take of male and female. God created men and women to join together in marriage and create families in which we acquire the fullness of love and goodness. This is what Unification teaches regarding the Biblical second blessing. Children are meant to receive love from their parents—their food, warmth and care, and children naturally return love and joy to their parents in different ways as they grow from little infants all the way to old age. Siblings' love has the same eternal quality as does conjugal love and parental love. This the universal, eternal, ever dynamic and creative quality of family life—what Reverend Moon calls the "Four Realms of Heart." It is the life originally designated as the way for every person, and the ground from which our natural ease for goodness would be based. Having traced the absence of ideal families to the human fall (above), which separated family life from God's co-creative presence, Reverend Moon teaches that "rebirth" as a family is necessary to correct our separation from God and restore us to God's lineage. To this end, Moon invites the people of this world to participate in the "Blessing," a ceremony of marriage dedication (or re-dedication) which cuts the bond to Satan and engrafts couples into "God's original blood lineage," and then to calls them to the mission of creating ideal families as the places to cultivate love. In an ideal family, love has no boundaries. First, there should be deep understanding between family members—no fighting, no divorce, no jealousy, with all family members working for the common good of the family. Next, families will love and care for other families, and to work for the common good of their community. Next, communities will act for the benefit of other communities and work for the sake of the nation. Next, nations should understand and love other nations, working together for the the common good of the world. In this way, cultivating true love in the family is seen as the starting-point for world peace. This is the path to establishing "God's original ideal of creation" that was lost at the time of Adam, aborted with the premature execution of Lord Jesus, and successfully begun with Reverend and Mrs. Moon functioning as True Parents, restoring the position of "original human ancestors," and offering the "Blessing" whereby recipients can stand in and procreate "God's original blood lineage" and substantiate and expand its unending abundance of love in the world. 1960 1 + 3 couples: The first Blessing ceremony was held on April 11 1960, with Rev. Moon's blessing in marriage to Han Hak Ja, followed on April 16, by 3 couples from among his disciples. 777 Couple Blessing (October 21, 1970): Including a large number of Japanese members and a few western members, following the work of missionaries who went to Japan from 1962, and to the U.S. starting in 1969. 30,000 Couple Blessing (August 25, 1992): Included the first participants from former Soviet countries, participants from other faiths, and a large number of previously married couples, renewing their vows while making a commitment to create ideal families. 400 Million Couples: Held in stages beginning in 1998, in ceremonies all around the world. 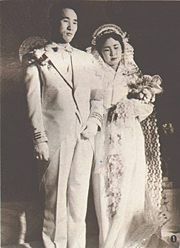 Sun Myung Moon married Choi Sun-gil in 1943, in the North, and soon afterwards moved to Seoul. Soon after their son Sung-jin was on born March 1, 1946, Moon traveled to North Korea for what he expected to be a brief stint of evangelical work. He did not return to the South and to his family until 1951, and the combination of his sudden departure, the long years away without any communication, Moon’s extraordinary devotion to his church community at the expense of his family from whom he'd been absent for so long, and Ms. Choi's strong (conventional) Christian roots resulted in her decision to divorce him in 1959. Reverend Moon's second son Hee-jin, born during this time (1955), was killed in a tragic train accident in Seoul in 1969. Despite suffering loss and many challenges during Reverend Moon's decades-long public ministry, his family members have emerged to provide substantial support for his public mission. Hak-ja Han has become an evangelist in her own right, traveling the world on numerous speaking tours since 1992. As his children matured, they too began public missions which have included speaking tours and giving marriage Blessings in countries around the world; recently even his grandchildren have joined in. The Moon family is now seen by many as inheriting as a unit providential responsibilities from the work begun by Reverend Moon. Reverend Sun Myung Moon has dedicated his life to building world peace. Knowing that different people will become interested in the process of building world peace in different ways, Rev. Moon has founded dozens of organizations with the common goals of advancing international understanding, helping bring people closer to God and each other, and building lasting peace in the world. Starting out as an evangelist in war-torn Korea in the early 1950s, with a handful of followers, he now has groups and organizations under his leadership in more than 180 countries around the world. Many of those who have studied his teachings feel that he has been chosen by God to guide the world's people to build lasting peace, which is centered on spiritual values and the practice of love. From the twentieth century, worldwide consciousness that international cooperation and a global approach were essential to creating world peace have steadily increased, resulting in the formation of bodies such as the League of Nations after World War I, and the United Nations after World War II. Feeling that a stronger focus was needed on solutions to the moral and spiritual problems underlying the obstacles to world peace, Rev. Moon has created several vehicles toward world peace, the most recent of which is the Universal Peace Federation. Women's Federation for World Peace, founded 1992, is a women's movement with three goals: True families, a sound moral society, and world peace based on women's spirit of true love. WFWP sponsors sistership ceremonies connecting women from different countries, and service projects in branches all around the world. Mongolian Peoples' Federation for World Peace, founded in 2004, seeks to bring together people from all corners of the world who share common origins in the Mongolian steppes of Asia, to share common values and ideals of interdependence, mutual prosperity, and universal values. Inter-Religious Federation for World Peace, inaugurated in 1991 to become the umbrella organization for the vast world of inter-religious activity undertaken by Reverend Moon from the earliest moments of his public ministry. The Inter-Religious Federation for World Peace extended its outreach through a great many organizations built around unique concepts and constituencies. Religious Youth Service, and religious sports activity for young people, New Ecumenical Research Association for religious scholars, Council for the World's Religions for religious leaders and religious professionals, and others. Federation for World Peace, inaugurated 1991, was the precursor to the Inter-Religious International Federation for World Peace. Following Rev. Moon's first meeting with President Mikhail Gorbachov and Raisa Gorbachov in Moscow in 1990, the Federation for World Peace was inaugurated to bring together society leaders, including current and former heads of state, to discuss solutions for world problems and routes to peace. The inaugural meeting in August 1991, was attended by twenty five current and former heads of state, along with 1000 representatives of governments, non-governmental organizations and grassroots organizations from more than seventy nations. Family Federation for World Peace and Unification, founded 1996, works for the moral regeneration of the family, encouraging people to actively invest in activities to strengthen their families, including participation the Blessing. 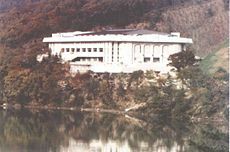 Summit Council for World Peace, from 1987, was the precursor to the Federation for World Peace, a forum for former heads of state, sitting heads of government, and other outstanding international figures. International Federation for Victory Over Communism was founded in 1968, after Rev. Moon systematically developed his ideological critique and counterproposal to communism in the 1960s. IFVOC conducted educational programs and rallies in Korea, Japan, and around the world in the 1970s and 1980s. As early as 1972, Rev. Moon declared that communism would begin to decline around 1977, and would be "thoroughly discredited" ten years later. In 1984, he called for a conference to be titled "The End of Communism." The idea was nearly unbelievable at the time, but within five years, the Berlin Wall came down, and communism began its decline. At that point, Reverend Moon articulated his position as "Headwing," combining the left and right wings. Rev. 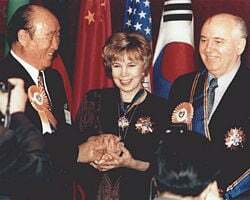 Moon had personal meetings with Mikhail Gorbachev (1990) and Kim Il Sung (1991), advocating that they open their countries to all religions and to the world market. CAUSA was founded in 1980, as part of a multi-faceted effort to combat communism. Working primarily in Central and South America, CAUSA conducted conferences, educational programs, and social service projects during the 1980s designed to strengthen the social fabric to better resist communist influences. In North America and Europe, CAUSA held International Security Council conferences to expose the threats of the Soviet Union and its allies during the cold war period. In the U.S., American Leadership Conferences were held to educate state legislators, mayors, and city councilmen affirming the existence of God and rejecting atheistic communism. The International Highway Project was first proposed in 1981. The project envisions a highway that will link the countries of all corners of the world, and includes a tunnel to connect Japan with the Asian continent through Korea, and the Bering Strait Tunnel, connecting Asia with North America. Federations of Island, Peninsular and Continental Nations for World Peace are sister organizations that seek to strengthen the natural bonds among nations sharing common geographical configurations and challenges. Citizen's Federation for the Unification of the Fatherland was founded in 1987, to work for the reunification of North and South Korea. International Relief and Friendship Foundation (IRRF) was founded in 1975, to provide humanitarian relief, and has provided disaster relief in Africa, Central and South America, as well as education and medical assistance programs. Aewon, a volunteer service organization, founded in Korea in 1994, provides support and educational programs for the elderly, needy children, the disabled, farming and fishing villages, the jobless, and the homeless, and provides cultural programs for orphans and disabled children. Isshin Hospital, Japan, established 1978, is one of the few Japanese hospitals that integrates both Oriental and Western medicine. The hospital also coordinates an overseas medical service which sends teams of doctors and nurses to the world’s most impoverished areas. Cheongshim Hospital, Gapyung, Korea, established in 2003, is one the few hospitals in the Orient that provide a full range of both Western medicine and Oriental medicine. The hospital, with its state-of-the-art medical facilities, is located two hours from Seoul at the beautiful mountain resort area of Cheong Pyeong. Patients, upon entering, choose whether they want a Western doctor or an Oriental doctor, or both. World Media Association, founded in 1978, to provide an international forum for media professionals and opinion leaders, to explore the media's responsibility in today's rapidly changing world. The Washington Times, founded in 1982, to provided balanced reporting in Washington. Segye Times, Korean daily newspaper founded in 1989. Sekai Nippo, Japanese daily newspaper founded in 1975. Ultimas Noticias, Spanish language daily published in Uraguay since 1981. Tiempos del Mundo, international Spanish language daily distributed in Latin America since 1996. Middle East Times, weekly newspaper founded in the Middle East in 1983. United Press International, global news agency, headquartered in the United States, Tfounded in 1907 by Edward W. Scripps; acquired by News World Communications in 2000. 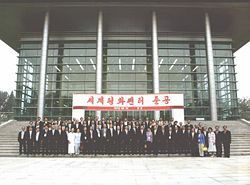 Professors World Peace Academy, founded in Seoul in 1973, with an initial gathering of 168 professors from Korean and Japan, with a goal of promoting better relations between Korean and Japan, two nations that were historically hostile towards each other. Since that time, PWPA has expanded to include professors from around the world, publishing the International Journal on World Peace, and sponsoring conferences, debates, and forums on pressing and long-range policy issues. International Conference on the Unity of the Sciences was organized in 1968, and held its first conference in 1972, with twenty participants from eight countries, addressing the topic Moral Orientation of the Sciences. Conferences encouraged scientists and scholars to cooperate in searching for ways to build peace, to pursue absolute values, and to allow religion to be the conscience for scientific endeavor. Paragon House Publishers began in 1981, as a publishing program to serve the community of ICUS scholars. Since then, the scope has expanded, focusing on books of cultural and international significance. Unification Thought Institute was founded in 1972, conducting international seminars seeking basic solutions to the philosophical issues at the root of the chaos in modern society. Unification Thought, a philosophy that encapsulates Rev. Moon's basic teachings, provides keys through which traditional religions, philosophies, and cultures can be harmonized. World University Federation was founded in 1996, with a goal of creating long-distance educational exchange and degree programs between universities utilizing internet technology. Sun Moon University, University founded in 1989, Cheonan, Korea, incorporating the former Sunghwa Theological Seminary, founded in 1977 as Unification Theological Seminary, Guri, Korea. University of Bridgeport, Connecticut, United States, operated in partnership with Professors World Peace Academy since 1992. Unification Theological Seminary, offers professional training in ministry with a Masters of Religious Education and a Masters of Divinity, Barrytown, New York, Founded 1975.
International Educational Foundation was founded in 1990, to promote moral education in schools. World Conference on Preservation and Sustainable Development in the Pantanal, first held in 1999, with the goal of seeking ways to develop the Pantanal area without destroying its natural treasures. Cheongshim Graduate School of Theology, Gapyeong, Korea, founded 2003. Kyungbok Elementary School, Seoul, Korea, founded 1964, part of Sun Moon foundation since 1978. One of Korea's top private schools. Sunjung Girls' Middle School, Sunjung High School and Sunjung Girls' Vocational High School, sponsored since 1989. Institute of Korean Studies for Foreign Students, an exchange study program on the campus of Sun Hwa Arts School, operated since 1982, provides classes in Korean language and culture for international middle school students. Sunhwa Kindergarten, on the campus of Kyungbok Elementary School, provides education for 4, 5, and 6 years olds in an atmosphere that describes itself as Right, Good, and Orderly. Bridgeport International Academy, High School, Bridgeport, Connecticut, founded 1997 (formerly New Eden Academy). The Principled Academy, pre-school through 8th grade, San Francisco Bay area. New Hope Academy, pre-school through 12th grade, Landover Hills, Maryland. Jin-A Child Care Center, state certified pre-school, Clifton, New Jersey. Bridgeport Hope School, elementary school, Bridegeport, Connecticut. Pyung Hwa New Hope School, 1st through 8th grades, Clifton, New Jersey. Blessed Teens Academy, residential middle and high school program for children of Blessed Families, Reno, Nevada, founded 2003. Cheongshim International Academy, Gapyung, Korea, middle school and high school programs with instruction in English, founded 2005. Cheongshim Kindergarten, Gapyung, Korea, founded 2006. High School of the Pacific, Hawaii, high school program for students from Oceania, founded 2004. New York City Symphony, New York, sponsored since 1973. 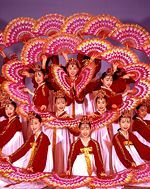 The Little Angels of Korea, a company of 200 young women performing Korean traditional dances and international songs, founded in 1963. Universal Arts Center, (formerly Little Angels Performing Arts Center) opened in 1981, with a 1200 seat theater, a full stage house, conference rooms, and rehearsals studios. founded 1984. Performing both at home and on international tours, Universal Ballet presents masterpieces from the classical ballet repertory as well as works by leading contemporary choreographers. Manhattan Center Studios, concert and recording facilities in the Manhattan Center building, New York City. Literary Federation for World Peace is an initiative calling for writers to recognize the higher purpose of literature, to convey meaning and direction to people who have lost their bearings. 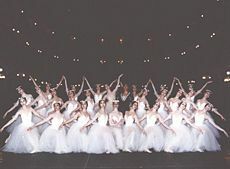 Kirov Academy of Ballet, Washington, DC, founded 1990, boarding school with professional ballet training and a full middle and high school academic program. Sun Hwa Arts Middle and High School, Seoul, Korea, founded 1973, top private academic arts middle and high school with training in music, dance and fine arts. All religions have the same fundamental goal, to connect people with their creator, with the power of the universe, to empower people to reach their full potential. It is an unfortunate truth that over the centuries, there has been a great deal of strife and disagreements between religions, and even wars and killing in the name of religion. The Inter-Religious Federation for World Peace, founded 1991, brings together leaders, believers, and scholars from the world's religions to work for harmony in the human family, where religion has too often been a cause for division. IRFWP has published World Scripture, a Comparative Anthology of Sacred Texts, to help illustrate the shared values and universal foundations common to all religions. Religious Youth Service, founded 1986, brings together youth from different religious backgrounds to share in social service projects and to experience a variety of inter-faith experiences and seminars. Youth Seminar on World Religions, from 1982. 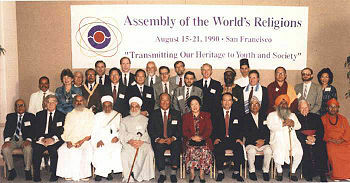 Assembly of the World's Religions, from 1985, gathers over 1000 top religious leaders, scholars, and young people for interfaith encounters, seminars, and discussions. International Coalition for Religious Freedom, founded in 1984, is dedicated to defending religious freedom for all people. International Christian Professors' Association, Korea, from 1981.
International Christian Students' Association, Korea, from 1981. Interdenominational Conferences for Clergy, United States, from 1982. Teaching Family Wisdom: Hoon Dok Hae is a practice of gathering and reading together from books of family wisdom drawn from Rev. Moon's sermons, to find spiritual nourishment and inspiration. True Family Values Ministry provides marriage and family counseling based on Rev. Moon's teaching. Grass-Roots Family Education: Tong Ban Kyok Pa, work throughout the neighborhoods and villages of Korea to promote family values and provide family support services. Cheongpyeong Heaven & Earth Training Center, founded 1971, provides a program of weekend retreats through longer 40-day or 120-day training sessions, for spiritual renewal, cleansing and healing, addressing individual and family problems, and providing opportunities for meditation, reflection, and repentance. Cheong-A Camp Youth Training Center, established 2005, workshop center for youth retreats and workshops, in the Cheongpyeong area, Korea. Jardim Ideal Family Workshop in Jardim, Brazil, provides spiritual retreats and training sessions for conjugal harmony, family life, and practical guidance on living for the sake of others. Women's Federation for Peace in Asia, founded 1991, precursor to Women's Federation for World Peace. Youth Federation for World Peace, founded 1995, gathers young people together to encourage them to transcend barriers of ideology, nationality, culture, religion, and race to work for world peace. Collegiate Association for the Research of Principles (CARP), founded 1966, a campus ministry with branches in many countries, encourages colleges students to become leaders of character, to be involved in service projects, and to develop successful relationships in friendship, marriage and life. 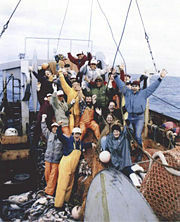 Ocean Church participants returning after a successful catch. Rev. Moon is in the middle with the green jacket. Pure Love Alliance (PLA), founded in 1995, encourages young people to choose sexual abstinence before marriage, and fidelity within marriage. PLA holds marches and rallies to raise public awareness, provides educational programs, and encourages young people to participate in public service projects and volunteerism. Ocean Church, since 1981, has been providing Ocean Challenge character-building programs of ocean fishing for young people in coastal locations around the U.S. Martial Arts Federation for World Peace, founded 1997, gathers masters and instructors from different forms of martial arts to work together to inspire moral and spiritual renewal among the world's young people. World Cultural and Sports Festival, founded 1995, festivals including conferences addressing many different aspects of work regarding world peace and Blessing Ceremonies, along with international sports competitions involving all countries participating in the conferences. In August 2012, Reverend Moon was hospitalized with pneumonia. He was admitted to St. Mary's Hospital in Seoul where his condition became critical. After spending two weeks on a respirator in intensive care, where he suffered further organ failure requiring dialysis and other measures, he was transferred to the church-owned Cheongshim Hospital in Gapyeong, northeast of Seoul. There, surrounded by his family, Sun Myung Moon passed peacefully on the morning of September 3, 2012 (1:54 am KST; September 2, 12:54 pm EDT) at the age of 92 (93 Korean age). Unification Church members worldwide immediately began gathering to pay their respects and to attend the Seonghwa (funeral) ceremony on September 15, 2012. Scholars have noted that Reverend Moon's legacy will endure, not just for the controversies that surrounded the mass weddings and accusations of "brainwashing," but also for "creating what was arguably one of the most comprehensive and innovative theologies embraced by a new religion of the period." This legacy comprises the Divine Principle and more religious teachings, the Unification Church that he founded and spread world-wide, hundreds of thousands of Blessed families, and numerous cultural organizations and businesses, including the Washington Times newspaper. His life's work was to make the foundation for lasting peace in the world. In particular, Reverend Moon strove to find ways to reunify his homeland of Korea. He met North Korean leader Kim Il Sung, whom he embraced as a brother in 1991. Despite his staunch anti-Communist stance, Reverend Moon and his family continued to develop connections with the North Korean leadership, including establishing Pyonghwa Motors, a joint business partnership between a Church-owned South Korean company and a state-run North Korean consortium. When Reverend Moon died his youngest son, Hyung Jin Moon, traveled to North Korea to meet with mourners at a church-owned peace institute in Pyongyang. North Korean leader Kim Jong-Un sent condolences and a wreath delivered by Jang Song-Thaek, whose wife is the sister of the North's late leader Kim Jong-Il. 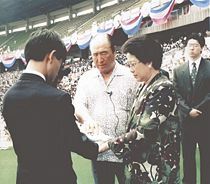 Hyung Jin Moon also received the "National Reunification Prize" on behalf of Reverend Moon for his contributions to reunification: "Moon positively contributed to realizing the nation's reconciliation and unity and the country's peaceful reunification and achieving the prosperity common to the nation." It was in Reverend Moon that I found the broadest ecumenical spirit, a fierce commitment to the unity and fraternity of mankind, an unflinching love of all people, a total commitment to the institution of the family, a tolerance for the diversity of humankind and the need for its harmonization. I also found in him the wisdom to blend the Occident with the Orient, the North with the South, an ability to combine eternity with a sense of the contemporary reality, the insights to create a bridge between science and faith, the courage to wage warfare against escalating hedonism, and an abundance of the divine as well as the human gifts of humor and love of life. ... His place in human history is assured. We merely must make certain that the seeds he planted for true peace are nourished by all of us throughout the world. ↑ Messages of Peace: Pyeong Hwa Hoon Gyeong (Family Federation for World Peace and Unification), 103. ↑ The first published edition of the teachings was Wolli Haesul (1957). The current Korean text of Exposition of the Divine Principle (Wolli Kangron) was published in 1966. ↑ Sun Myung Moon Homepage, Sun Myung Moon's teaching. Retrieved October 29, 2007. ↑ Eileen Barker, My Take: Moon’s death marks end of an era CNN (September 3, 2012). Retrieved September 13, 2012. ↑ Armin Rosen, Sun Myung Moon's Groundbreaking Campaign to Open North Korea The Atlantic (September 6, 2012). Retrieved September 13, 2012. ↑ N. Korea sends wreath to Moon's family: State media Asia One News (September 07, 2012). Retrieved September 13, 2012. ↑ Nicholas N. Kittrie, Sun Myung Moon: The Builder of Bridges From the Foreword, The Seeds of True Peace, IIFWP (2002). Retrieved September 13, 2012. Henricks, Tyler, Andrew Wilson, and Michael Inglis. The Healing of the World an Introduction to the Life and Teachings of Sun Myung Moon. New York, NY: Holy Spirit Association for the Unification of World Christianity, 1994. Rev. 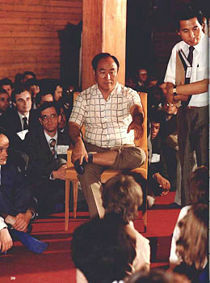 Sun Myung Moon and Mr. Kamiyama in Danbury Prison, 1983. Reverend Sun Myung Moon's signature. All links retrieved November 21, 2014. This page was last modified on 7 December 2018, at 15:02.